Finally the day arrives that would be the great finale for a lot of Stream of Passion Legion members. All songs from the fourth album A War Of Our Own (marked 4 in set lists) will be played live on the main stage of the (new) Bibelot. It’s also the official release date for the independent, crowd funded release. For the Legion Members this was totally not relevant, as they had already their copy either by digital download, regular mail or for some lucky ones by personal delivery by band members last weekend. Being part of the party was the thing. On a lovely spring afternoon I was rushing towards the Press Conference of Van Canto. A Press Conference? Yes, because too many press responded positively to the opportunity provided by Napalm, that simply doing separate interviews would take too much time. Despite being a lovely day, traffic didn’t align with that feeling. So arriving a little late I found out that Van Canto was also delayed due to challenges crossing the Canal. Also other press came in late. As the first writer present at the press conference along with Stef (Stefan Schmidt) and Ross (Vc Thompson), I got the opportunity to do my questions immediately. As it was an unrecorded session, it’s hard to recall who said what and the answers are credited to Van Canto. 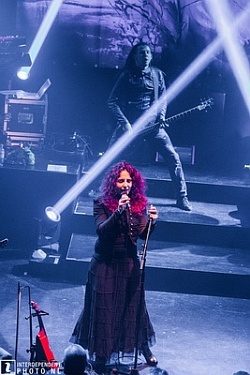 For the second time, I had the chance to see Within Temptation playing in Lyon, my hometown. They're currently on tour promoting their lastest album Hydra, and the Dutch band Delain - that most of us already know - are the support band. What’s nicer than closing the weekend on the Sunday evening with a gig of two top bands: Xandria and Delain. Adding to that I’m picked up by two reporter colleagues of Rockportaal. How convenient. We were a little early, so we had to hang-out with already a great group in fans in the sun. How bad can it be at the end of March?